Fake news. Misinformation. Disinformation. Whatever you choose to call it and however serious the problem may be, it goes without saying that public perception of the media is at an all time low. A survey conducted by the European Commission between November 13, 2017 and February 23, 2018 found that 99% of those surveyed claimed to have been exposed to fake news, mostly through social media platforms such as Facebook. A separate 2018 survey conducted by the PEW Research Center found that while more than two-thirds of US adults at least occasionally get news from social media platforms, a majority (57%) of these consumers say they expect the news they see to be largely inaccurate. Facebook has taken steps to crack down on bad actors responsible for fake news within its ecosystem, but there’s only so much one can do in this age of unfettered permissionless publishing. Instead of trying to fight fake news at its source, PUBLISHprotocol offers a trusted platform for legitimate publishers as a means of restoring confidence in quality journalism and mitigating the influence of bad actors. Through PUBLISHsoft, our proprietary blockchain-based content management system, publishers will have the option of publishing content in blockchain transaction comments, thereby rendering the content immutable and tamper-evident. We’ve identified the FLO blockchain as a preferred blockchain for this because of its metadata feature and integration with the Open Index Protocol, which provides a standard for uploading content to the FLO blockchain. In the beginning, the comments will include the article’s content, the time and date of submission, and the name of the writer. They will also include a hash of the article as stored on a distributed storage system (e.g., the IPFS), along with any files (e.g. pictures, videos) included in the original submission but deemed too unwieldy for blockchain transaction comments. Publishers will nonetheless retain the ability to add, edit or delete content in the interest of maintaining their own voice. However, any modifications or retractions will remain visible for all to see via a blockchain explorer, thereby serving as a stamp of integrity and helping to restore trust among publishers that commit a certain percentage of news articles to the blockchain. In the future, blockchain transaction comments will become more standardized in an effort to build a global database of articles that can be easily indexed, searched, and distributed. 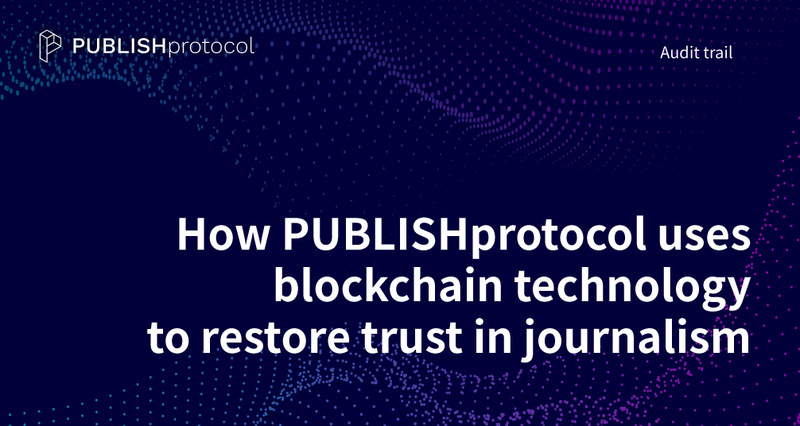 To achieve this, PUBLISHprotocol has entered into a strategic partnership with Alexandria and joined the IPTC to develop the world’s first standard for news dissemination using blockchain technology. The idea of time-stamping digital documents using blockchain technology is not new. In his 2008 white paper ‘Bitcoin: A Peer-to-Peer Electronic Cash System,’ Satoshi Nakamoto includes references to three works by cryptographers Stuart Haber and W. Scott Stornetta, the earliest of which dates back to 1991 and describes a procedure for time-stamping digital documents. The duo, regarded by some as the co-inventors of blockchain technology, wanted to implement a system whereby a digital file (e.g., text, picture, video) could be rendered tamper-evident. In 1994 — 14 years before the conception of the Bitcoin network — they launched an information assurance software and services company called Surety along with its flagship service, AbsoluteProof. According to its website, AbsoluteProof is “a cryptographic timestamping service that enables organizations or individuals to apply tamper-evident digital ‘Seals’ to all forms of digital information, providing long-term and independent proof that the information existed at a particular point in time and has not been altered since.” Similar to Bitcoin, the mechanism uses hash chain linking to attest to the authenticity of a document.